What a pleasure it is to know that there are still so many generous and courteous gentlemen! However, we need to make some comments on the issue, so that your generosity does not do you a disservice. When you meet a lady for the first time, you do not have to bring any gifts with you. Any expensive gift is a BAD idea, as it will make a decent lady feel very awkward, while a potential scammer can think that you are an easy target. Presenting cosmetic products – nail polish, lipsticks or even perfume – as well as clothing is a BAD idea: firstly, you are not very likely to make the right guess about the taste of the fair, yet unknown lady, secondly, it is quite personal for the first meeting. A tourist souvenir from your home country is not bad, unless it is something like a low quality scarf of vibrant colors with the emblem of your local football team, but made in China. However, such gifts are a little bit “cold” and will not appeal to the feelings of the lady. A box of chocolates is a GOOD choice – especially if it is something typical of your area. Most ladies tend to have a sweet tooth, and even a fitness queen on a diet knows: a little chocolate now and then does not hurt. Flowers – bingo! This is the PERFECT option: not too expensive, not too intimate, not too impersonal, quite romantic and will not make her gain weight. Any lady will be shining when she is presented some beautiful flowers. Recently, we have even carried out an opinion poll asking our ladies what they consider to be an optimal present at the 1st meeting. 84 % were in favor of flowers, so it is not just our guess, but a proved fact. What is important, in case you bring a few flowers, be sure their number is ODD: 3,5,7 (Just a tradition, but a strong one). Once again: bringing a present at the 1st meeting is not at all a “must”. You are the only reason for the lady to come. Nevertheless, if you want to gain some additional points from the very start, you can rely on our advice. 2018 is a very special year for our agency. We have our 20th anniversary this year. 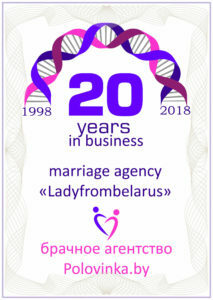 It means that we have been helping to single foreign men and belarusian women to find their happinness in life for 20 years already. During this period we have helped to almost 1250 international families to appear, about 625 men and 625 women are now twice as happier as they have been before. Every day we do our best to help people to achieve their goals of having a family, of finding a person with common interests, mutual feelings, chemistry, of finding the one who means the world to you. We make the most to help every person who comes to our agency. We are in favour of a personal approach and try to make your way of finding the right person as short as possible. We believe that the best way to meet your soulmate is through a real meeting. Calls in Whatsapp, video chats in Skype won’t give you the right impression of a person but a real meeting will do. Some people will say that it is not right to meet someone without preliminary chat at least. But we say our approach works, our families exist, and it’s not just a number taken out of the blue, these are real happy families (photos at our agency prove that :P). Every member of our staff is completely immersed into this process, everyone puts their heart in this work. Although not always it is easy to establish a relationship, a true bond between people but the reward covers all the efforts taken, all the hardships overcome, all the worries and concerns felt and this reward is gratitude of our clients, these are wedding photos or photos with kids, these are family visits to our agency (we are always happy to see our families), these are positive feelings that we get seeing our happy clients. We are always there to make people happy. The first meeting in the agency is still not a romantic date, so you do not have to bring an engagement ring and the lady does not expect that you will propose to her right after a pleasant conversation. If there is mutual attraction, it is just awesome, but you both will take your time to understand what your heart (and brain!) tells you. However, the first meeting is extremely important as this is the first step to explore the universe of each other and it may well be the first brick in the foundation of your future relationship. What am I driving at? Well begun is half done! So let’s see what can prevent you from making a good beginning and destroy your chances for a happy ending. Never come to the first meeting smelling of alcohol or – gracious heaven! – drunk. Of course, you are in Minsk on holiday and you may feel you have every right to relax and enjoy. Alcohol addiction is for sure what all decent Belarusian ladies hate and fear of, so at the slightest suspicion that a man is a boozer, they will hurry to close the door on him forever. Almost every foreigner has heard about repulsive Eastern European alcoholism, so nobody can blame the ladies for such a behavior. Never tell the lady about your ex-wife/ex-girlfriend either in a negative or in a positive way. Well, if she asks, feel free to answer, but keep it as short as possible. A very detailed sad story about bad relationship experience is likely to give an impression that the man puts all the blame for the failure of their union on his ex, which may mean he is egoistic, unable to manage a relationship, lacks understanding, does not respect women and so on. If the man sings praises to his former partner to show that he is objective and respectful despite everything, the lady hears just one thing: “He is still not over her” and drives away any hopes that he is really ready for a new relationship. There is no good looking back, that’s it. Never forget that the most attractive man is the one who looks clean and tidy and smells good. Our ladies have the idea that foreign men take good care of themselves (unlike many Belarusian guys) and they will be extremely happy to see that it is true. Just be sure you have enough clean shirts with you and remember that it is perfectly OK if you feel nervous, but the lady must not smell it or see it on your clothes. Yes, you will have the initiative to go on with the relationship, or not to keep in touch with the lady, but she will make her decision about you, too. Yes, the lady knows you are meeting not only her, but she will not be extremely happy, if you gladly say it to her face. Our advice (however obvious and self-evident it may seem) is based on real events – and we hope nobody will ever slip on the same banana peel! When you are planning a trip to Minsk to meet some ladies, you are sure to be curious (or maybe a little nervous) about how the meetings will go. We want you to feel confident and comfortable during the whole process, so here we are to throw some light on what is expecting you in Minsk. We offer a unique opportunity to speak face-to-face with a lady you liked by her online profile. You can tell her the most essential things about yourself and ask her the questions that matter to you. In this way you will see if you share some interests, values, opinions. What is even more important, you will understand if there is mutual attraction – this very special love chemistry which can unite your hearts and become the basis for the most precious relationship ever. The first meeting takes place in our office: we have a separate room where you can talk over a cup of tea or coffee. Sometimes our clients tell us they would prefer a more romantic setting – a fashionable restaurant or cozy cafe. You may be sure that a lady comes to get acquainted with you and not just to enjoy a meal or a drink in a lovely place. If you like each other, you can ask the girl out right after you meet her in our agency, you are not obliged to stay here for any certain time. We will organize the meetings about a week in advance before your arrival and send you the schedule. The planning will depend mostly on the time availability of the girls. Weekends are the best time, as the ladies can come to meet you any time of the day, while on weekdays, as a rule, the meetings can be organized in the evenings. You can tell us your wishes about the desirable order of meetings and we will try to follow it, if possible. 1 meeting lasts 1-1.5 hour on average. The duration of a meeting is not limited, though: it depends on the time that you both have at your disposition, if the conversation goes well, if you like each other etc. The number of meetings per day depends on the plans and working schedule of the ladies. On average, there can be 1-3 meetings on a weekday, and up to 8 meetings on a weekend. In total, you can have as many meeting as you wish, depending on the time period you stay in Minsk, the number of positive answers and if you yourself will be comfortable with them. Normally, our clients have 5-10 meetings. After the first meeting you have the contacts of the lady – and your real impression of her. If you have a positive feeling – go for it! Start talking with her on messengers. If time permits, invite her for a walk, a meal or any other activity that may interest you both. Now it is up to you two to build up your relationship from the first mutual attraction to deep affection and love. For our part, we will be glad to assist you with our advice whenever you need it. the better you look, the better impression you can produce 🙂 However, do not dress up especially for the occasion, as you should look natural and give a real image of yourself. The only advice is that your style should be neither too formal, nor too casual. do not bring any expensive gifts for the first meeting. If you want to make a pleasant surprise for the lady, choose a small box of chocolates or some flowers (importantly, an odd number!). Of course, time is always of great value and if you really like someone, it makes you particularly impatient. In this case chatting on Skype, whatsapp or exchanging emails seem to be the perfect first step towards the love of your life. Well, it is quite true that contacting a lady directly is the fastest way to start acting. Is it the most efficient way, though? No. Two decades of our experience leave no doubt: a personal meeting is what can really prevent you from wasting your time, money and energy.Here are a few myths about the benefits of distant communication before a real meeting. 1. Communication will give you a profound impression about the lady and you will not be meeting a stranger. Actually, the impression is very likely to be false, because you can get to know something about a person only if you write each other really long and detailed letters, or communicate very often via Skype. In practice, however, it often results in casual chatting about nothing, something like: “How are you today?” – “I am fine, but have had a tiring day, let’s speak another time”. It is not the communication that can reveal what kind of person you are or she is.2. The lady will feel more comfortable if you start from messaging her. Our ladies sometimes say: “Yes, I am interested to communicate with this man and I would really love to exchange letters with him, but I have never communicated in such a way, I am not sure what should I write…” Other ladies who have had the experience of speaking with men on the Internet may have got bad results: like getting to know men who just chat, but will never get to anything more serious. That is why they have been disappointed in this way and do not want to waste their time on somebody whom they have never seen and probably will never see.3. Speaking on the Internet can show if you have something in common. Well, that is a good point – if you are looking for a pen pal, “imaginary friend”, someone to talk to, to share your thoughts with. However, you are here to find your love, the woman of your life, your future partner, aren’t you? The real love “chemistry” is not what you can feel from emoticons, stickers and sweet pictures in the messengers. It is not what a webcam can transmit. It is something that speeds up your heartbeat when you are at her side, hearing her voice or looking into her eyes. Even if you do not speak the same language, love will find the way to enter your soul.Organizing your trip to Minsk may take you some time, but in this case the slower you go, the farther you get. Put aside your smartphone or laptop for a while and let your heart guide you. Sometimes men who want to use our service ask us to choose some good and serious girls for them to meet. Well, this request actually does not make much sense: if we considered some ladies to be dishonest and not serious, we would not work with them at all. If we have some grounded complaints about a lady or notice inadequate behavior from her side, we delete her profile from our database. So, all the ladies you can see on our website are good in our eyes – but different, that is why we cannot predict who will be the perfect match for you. Every our client says he wants to meet a nice and sweet girl, nobody really wants to get acquainted with a cold and unfriendly lady, but this does not mean they all will fall in love with the same lady. Since beside these really important, but very general, characteristics, there is a physical attraction and a lot of traits of character that make a personality. Taking all these into account, a conclusion about the compatibility can be drawn, but it is only you who can make it: who knows better than yourself what suits you? If you have a lot of positive replies: you do not have to meet all the women who said “yes”. You will decide how many meetings you would like to have – and we will give you our comments on the interested ladies to make you choice easier. In any case, it is always better to have more positive answers initially: it may happen that for some reason a lady fails to come and you will want to meet someone else instead. If you have a low rate of positive answers: it is difficult to say for sure why girls answer “no”, as we do not require any explanation. Actually, it is quite normal: there are always positive and negative answers, since the ladies have different images of their future partner. If they say “no”, it does not necessarily mean something is wrong with you or your profile; maybe you are just not the type of man they are looking for. To eliminate the main possible reasons of negative answers, we normally recommend paying due attention to the adequate age difference, making photos of good quality, adding more lively and detailed information about you. Having seen your choice, we will have some idea about the type of woman you are looking for, which will allow us to make reasonable suggestions about other ladies who can suit your criteria and be interested in you. Finding your real soul mate is a complicated process, where luck has a role to play. Also, the correct behavior is what helps to succeed: even if you meet a girl who can be compatible with you, you will need to build up a sound communication and then a relationship, which requires an adequate attitude to many things. We would be glad to assist you with our advice to make the whole thing more efficient and to help you overcome possible cultural differences, so that your story has a happy end. What you can gain from marriage agency? Let’s decide first the goal. What’s your aim when you visit the page of marriage agency? If your aim is to get acquainted with real person who can be possible candidate to create happy family, then you have found the right agency. If your aim is just chatting or amusement would you be so kind to click the cross in top right corner of the page? General goal can be divided into several stages. What is the first idea, if you decide to get acquainted with Russian (Belarusian, Ukrainian) lady? Find the website and write her? But first you should somehow filter fake profiles, “falling in love with you” from the first sentences. Ask her to skype in order to see that she is real? It’s a pity, but fake skype models are also widespread. But ok, you have found the real lady, involved her into communication, and decide to visit her in her city. At least you meet the lady in person and you can feel if there is something between you. But it’s really time consuming and rather expensive. Because one lady will be in one city, the other in the other… Nobody knows how many meetings you will need until you find your match. 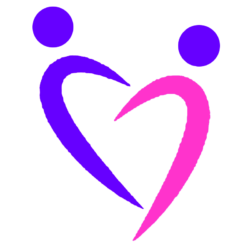 What does the marriage agency offer? We can help you to make first 2 steps easy and less expensive. You select the ladies on the website, we send them your profile, find out who is interested to get acquainted with you and then organize for you up to 10 meetings within one week-end. This will really help to overcome 2 most time/money consuming stages and you will meet up to 10 beautiful within 1 trip to Belarus. Isn’t it amazing? Moreover, we organize the meetings like no any other agency does. How? I’ll tell you later. Why are Belarusian women looking for love abroad? Yes, it may be difficult to understand, but the social and cultural situation in Belarus makes our agency a “life saver” for many great ladies who were not lucky enough to find their Mr. Right here. And they do need much good luck to be with a good man! This can be explained by “quantity and quality” reasons. Sad statistics: due to a lack of male population which becomes more pronounced with age, not all women have the chance to meet their better halves. Traditionally it led to a good deal of rivalry: women tried to do their best in every field: in love, at work and in the domestic life. As a result, most Belarusian ladies combine the best of modern and traditional values: they are hardworking and persistent in their studies and career, active in their daily life, while they are still devoted to their relationship or family and try to be feminine and beautiful for their partner. Sounds like a real treasure? Yes, but like a diamond needs polishing, a real lady needs being respected, loved and appreciated. Unfortunately, not all Belarusian men can keep up with these simple requirements. The lack of male rivalry brought certain negative results: Belarusian men are quite often passive, unambitious and reluctant to enjoy life or to grow personally and professionally; they do not take proper care of their health and appearance, do not value their partners or wives etc. This is what makes many Belarusian women avoid unsatisfying or even destructive relationships with local men and look for love overseas. As you can see, the gender imbalance in Belarus is very favorable for men who are a minority and therefore of great value. A normal guy with no mental or alcohol problems can easily be with a beauty with university degree and superior cooking skills. 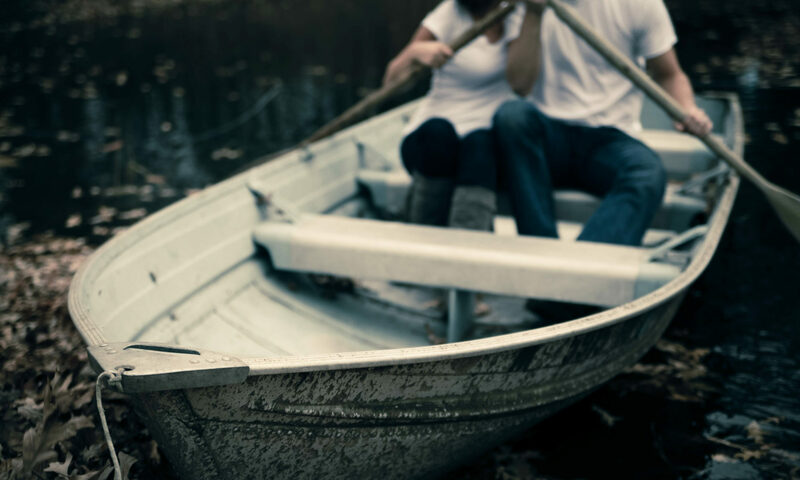 The ladies’ choice is by far more limited: it is quite hard to find an active and intelligent man who takes care of himself – and wants to create a family for life (instead of starting numerous relationships with new girls, which he may well afford). The search of the Mr. Right becomes even more complicated as the years go by: due to the tendency to get married early, all good family men at a certain point wear wedding rings and are treated like kings by their happy wives. So, what can the rest of our pretty Belarusian ladies do: wait for a miracle or try to be happy in love whatever it takes? This video was created as a reply to the questions of our clients. You can listen to or read the tapescript below. Sometimes, I see there are too many negative replies in your feedback table. I feel how frustrated you can be at the moment, but I ask you to listen to me for a moment and I’ll try to explain why it did happen so and what can be done to improve your profile and choice in order to get more positive replies next time. You can ask – I am ready to come from another part of the world to see her, why she denies me to have a cup of coffee and small talk? What does she loose meeting me? First of all couple of words about the agency. We run our business for almost 20 years and I’m working here since 2004 and during last 14 years it was my aim to change the attitude of the ladies towards the meeting. We make them agree only if they may consider the profile that they receive as a potential match. we organise the meetings at our office, not in a fancy restaurant, we do not ask the men to bring expensive gifts in order to stimulate the desire of coming to the meetings. We are doing all possible that the lady comes to the meeting if she is really interested. That’s why if you have 10 meetings at the agency, there will be 10 girls, interested in you, 10 real chances to find the love, not just 10 coming for a free lunch. So if you apply to another agency, that doesn’t have such a strict policy about the consent to the meeting, if you run into the agency, who “rewards” their ladies for coming, you’ll see completely another feedback list. But in that case maybe you will meet 10 ladies, that are closer to your ideal, but who can be absolutely not interested in you. What will be your choice? Why does it happen? First of all, I should say that Minsk/Belarus is not Phillipines, not Africa. Most of the ladies that you see at our pages, have university degree, many of them have good job here, run their own businesses, they are not starving, they are not desperate. Yes, we have less men than women in Belarus, that’s why they cannot find the husband here. And that’s why you come here, to find not just a girl, but educated, smart, good looking girl with normal family values. But 30 y.o lady with model look, good job and good education hardly will consider 50 y.o. divorced track driver from a small city, if he is not Brad Pitt. Same as in your country. But unlike with your country she can consider somebody 37-45 if he as we say is “standing firm on his feet” (has good job or own business), attractive to her and leads an interesting life and their wish to have a child is mutual. And it’s not a goldseeker, she considers somebody that can provide her the level of living at least not less than she has here. Why shouldn’t she? Your profession, your education are important. In general, they look for somebody more or less of their level of education. Of course, there are exceptions, like one the couples that we have, where she was professor of linguistics, and he was butcher. But more probable that someone with university degree would consider someone who had some post-school education, at least with college or post graduate professional courses. But the difference in age and social level it’s not all. They say, that man love with their eyes and the ladies – with their ears. It’s not 100% true. The lady should feel attraction to the photos you send. in general, the lady decides same as you: first upon photo: i like him or I do not like him. And only after that she starts to read the profile. Yes, it’s important that your photos are well-done. That they underline your personality, that they show you in the most effective way. If you are Brad Pitt – let she see it on a clear and quality photo. If not – maybe you are good cooker? Show her your kitchen and you working there. Are you good at sports, or you enjoy mountains every week-end – show it. You are good man for family – show you at your house welcoming your friends. If you are businessman – photo in nice costume will be good. If the lady receives photo where you are drinking big bottle of beer at the street or laying on the sofa in undershirt – she automatically comes to conclusion that you are good only in that kind of sport. What else is important in the profile? Your previous family. If you have 5 kids from different mothers it’ll not be the pro for your lady. If you are not divorced, but separated – it’s a red flag for the lady, as she understand, that even if everything goes well, you will not be able to marry her and to bring her to your country in a foreseeable future. Your wish to have child / not to have child – it should be mutual. If you don’t want anymore to have children and she is longing for it, she will say no even if your difference in age will be 5 years. And vise versa. She can say no, if you want to become a father and she doesn’t plan it anymore. Sometimes country is important. The citizens of well-to-do countries are more popular than the citizens of places with unstable economy (like in many places of Southern America). Citizens of close to Belarus country are more”popular” than citizens of Australia and New Zealand. Taller candidates are more popular than short language abilities are important and so on. There are some things that you cannot change anyway: for example your height / your weight / country / quantity of children etc. But there are things you can change to make your profile more attractive. you can think about interesting photos, good description of your education and profession, of your personal interests, dreams and desires. I do not recommend you to lie anyway. If you lie about your children – you will come to the meeting, pay for it, but if it’s unacceptable for the lady, she will refuse to keep on communication the day she knows about it. I hear almost everyday, I select with 30 years difference because I want to have a child. But can you answer my question: Why the lady should even consider somebody 30 years older to bring him a child? How you can attract her attention? What you can bring to her life that she will decide to date somebody older than her parents? If she wants to have a child so much, it’s much more clever from her side to get pregnant from a younger man, it’s healthier , anyway the father will not be at a high school graduation. My video seems to be very long. And i am sure, you are not happy with what I am saying. Because the other agencies offer you anybody, they assure you that you can get everything, just pay money. And I want to be sincere with you. I want to help you to find happy relationship for many years. Ok now you can estimate why the feedback was not so successful. You can always ask the agency how you can improve your profile / choice in order to raisen the positive feedback rate. By the way, good feedback rate is not 100%, it starts at 40 %, for the best profiles we have like 80% of positive replies. Why is it so? Because some ladies prefer bald guys, some ladies like firefighters, blondes/brunetts, ski-lovers and so on. So twice in 20 years we had like. 100% Have a nice day, have a nice quality profile, have a nice feedback from the ladies. Of course when there is a distance it is not always easy. Maybe one should correspond in advance? As for you question, it is quite difficult to answer it, because it can be very individual. On the one hand, the idea to get to know a lady and to try to establish some communication before meeting each other seems attractive, because in this case you have the impression that you are meetint not a stranger, but a person that you know. On the other hand, the problem is that this impression is very likely to be false, because you can get a more or less truthfull impression of a person only if you write each other really long and and detailed letters, or communicate very often via skype. In practice, however, it often results in casual chatting about nothing, something like: “How are you today?” – “I am fine, but have had a tiring day, let’s speak another time” It is not the communication that can you feel what kind of person each of you are, if you are compatible etc. Our opinion is that a personal meeting followed with intensive Internet communication is the best solution, but again, it can be different for different people, so we leave it for everybody to decide what is better. First of all – visit our Belarus Girls gallery and select the ladies you like. Make your list longer – better 10 or 20 ladies. Ready? It’s time to introduce you to Belarus girls! You send us standard self-introduction letter and our marriage agency will forward it to all the belarus women from your list. Start your introduction letter with a short description of your person: your name, age, where do you live etc. This information should be lively, but not very long, 2 or 3 sentences are enough. Please include a pair of good photos in your mail. One photo is worth 1000 of words. It’s really so. On first step your success depends on these photos on 70% – obviously, it should be your best photo. Please choose your photo properly. The photos should be clear, at least 1 face-photo and 1 full-length portrait. You should smile or at least look friendly there. >Something personal about you and your life. What is your profession? How do you spend your free-time? Do you have the goal in life? >Whom are you looking for? (it’s necessary for agency, we don’t forward it to the lady, maybe, we’ll recommend you somebody) What are the most important characteristics of the lady? For example: from 29 to 36, slim and blond, without children. How to get acquainted with all these Belarus girls? First of all you should select some ladies from our gallery of Belarussian ladies . We recommend you to make a list longer – not 1 or 2, but 10 or 20. Then you send us this list along with your good photos and self-introduction. We’ll forward your information to all ladies from you list and ask them, if they are interested to meet you in Minsk. Then you can buy tickets. When you know the exact date of you arrival, we’ll issue an invitation letter for tourist visa. 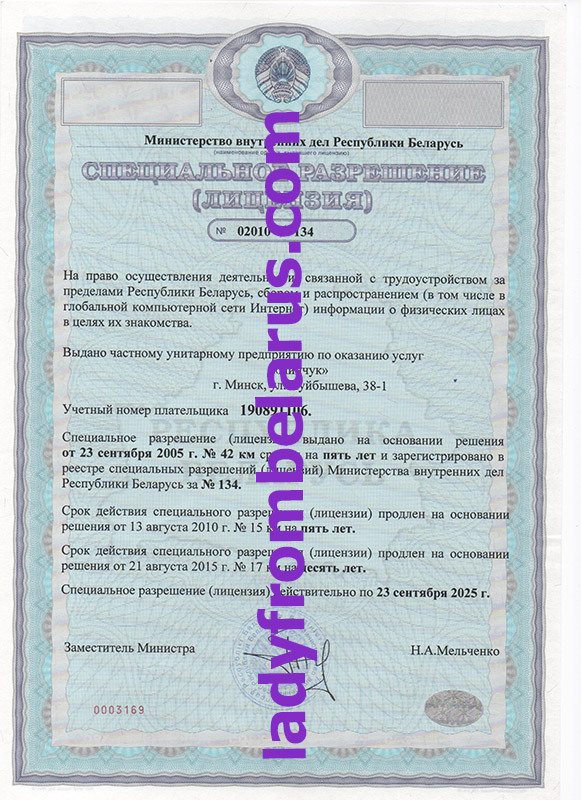 You can obtain tourist visa either in Byelorussian consulate in your country or at the airport Minsk International. We try to organize all the meetings within first days, in order that you have time to meet the ladies that you liked for the second and third time. 1 week is enough, 2 weeks – perfect. Usually we suggest age difference not more than 15 years. There are ladies, which accept bigger age difference, but is it really good for a happy family?